Its now becoming clear to me that the recent acquisition of EDS by HP is about 3 C’s - Consulting, Cloud & Computing. The IT industry is rapidly moving towards cloud computing, which is explained here in lay men terms, courtesy of Google and Amazon. EDS brings software development, management and consultin g practices, which HP doesn’t have as their software consulting business never made big. So this is a no brainier that by getting EDS its sending the message in marketplace that they want to engage in consulting, IBM is the target here. 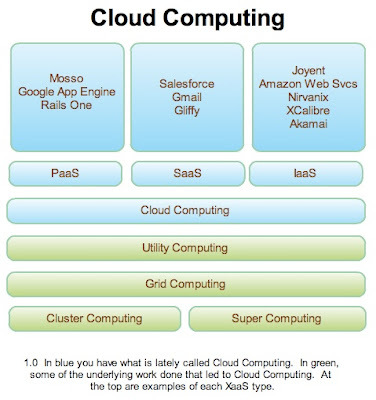 In addition to this the main/real aspect of this deal is about Cloud Computing – which has 3 basic pillars, Software As A Service (SAAS – Made Popular By Salesforce), IAAS – Infrastructure As A Service (Made Popular By Amazon), PAAS – Platform As A Service, which is an emerging trend where Google and Amazon are leaders. Microsoft is way behind in this space but they are trying with no success yet(Yahoo’s massive search infrastructure could have helped). HP’s business is predominantly around infrastructure management and services around it. Cloud computing is changing this landscape as infrastructure needs can now be address ed via web, as Amazon is demonstrating this with its EC2 service, known as IAAS. So this means HP needs to move in this space, but without software management and delivery capability, this can’t be done, so they needed someone like EDS. So in a nutshell it’s a well-planned move, little bit late as they are catching up, but leaves them ahead of Microsoft and IBM if executed! properly.